The IBM Simon is recognised as the origin of the smartphone. The prototype personal communicator concept was displayed at the 1992 Comdex Trade Show. 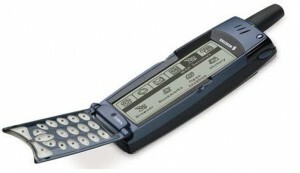 But the very first mobile to be called “a smartphone” was the Ericsson R380 brought out in 2000. It incorporated the two key features of today’s SmartPhones: a touch screen and an open operating system. The OS was the EPOC operating system first pioneered by Psion for its digital personal assistant and thrown open to other vendors to use. It was to lead onto the Symbian OS. However the R380 architecture did not envisage users down-loading their own Apps at that time. So the R380 had more of the character of a feature phone – with its focus on the PDA applications. The R380s operated on 900/1800 MHz. Another version, the R380, was brought out for the US market and operated on 800/1900 MHz. It was the first mobile to be marketed as a “Smartphone”.